A fun think and thin stripes print stretch crepe dressmaking fabric. We think this single crepe fabric range of one of the best fabric finds in years. We love this fabric! It is a crepe fabric with a slightly crinkled texture that hangs and drapes very well. However it still has a good amount of body which makes it not as slippery and easier to sew. Although there is no spandex in this fabric, it does still has a small amount of natural stretch, both length and width ways. This stretch element will make it easier to create clothes that fit great and it also means your clothes will be super comfortable to wear too. 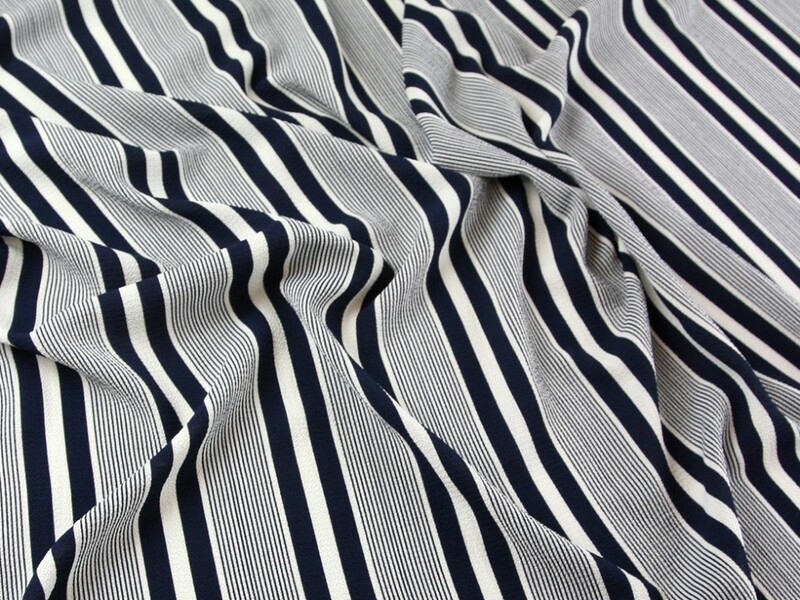 We picture this fabric making dresses, skirts and tops in most styles and the stripes are perfect for nautical styles!